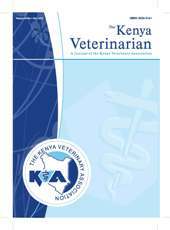 The Kenya Veterinarian is a journal of the Kenya Veterinary Association. It publishes original papers in English, within the whole field of animal science and veterinary medicine and those addressing legal and policy issues related to the veterinary profession. The journal accepts articles and reports in the areas of Anatomy and Histology, Animal Physiology, Biochemistry and Molecular Biology, Animal Sciences, Pathology and Microbiology, Public Health, Pharmacology and Toxicology Food Animal Practice, Companion Animal Practice as well as Wildlife Sciences in Kenya, East Africa, and the Continent of Africa. In addition, the journal publishes invited research reviews and reports of scientific meetings of the association as well as letters to the editor, commentaries and other topical issues for debate.